Are There Clues To Prometheus 2 In This New Comic Book Series? Earlier this week, Dark Horse Comics unveiled the first issue of Prometheus: Fire and Stone – a new four-part miniseries that finds a second crew heading to LV-223 in search of the wreckage (and more…) of the ill-fated expedition featured in Ridley Scott’s 2013 film. With Scott talking regularly about shooting a sequel to Prometheus, we were curious as to what we might be able to glean about a second film’s direction from the new comic series. The short answer? Not as much as we’d hoped. Don’t despair, though. We’ve got a theory or two to share with you. If you’re not up to speed on the comic, Giant Freakin’ Robot has a really great breakdown of the first issue. It features some spoilers, but if you’re not planning on grabbing the comics and are still curious as to what’s going on in the expanded universe (which will also work in the Aliens franchise, and Predator), then reading it will get you caught up in no time. 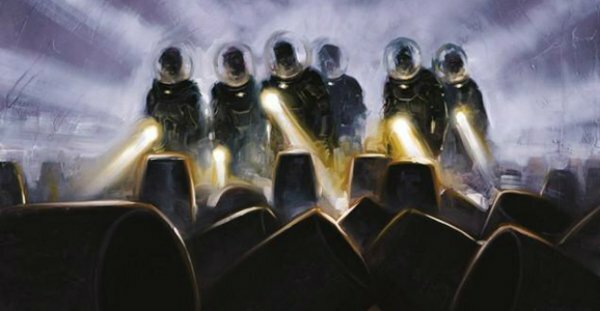 The biggest problem with trying to reverse engineer Prometheus: Fire and Stone to figure out where Prometheus 2 is heading is that the comic’s story is purposely set over a hundred years in the future from when Prometheus takes place. This was presumably done so the writers could tell their own story without having to tiptoe around threads Sir Ridley Scott might want to explore in his sequel. Logically, it’s a good approach. For a fan looking to write speculative articles? Not so much – if only because the premise raises more questions than it answers. One of the biggest is why is Weyland-Yutani heading back to LV-223 anyway? I’m not going to spoil all of the reasons, but clearly there’s something still on that hunk of rock that the company wants, but has waited over a century to go back and get (one potential hint – think about the opening of Scott’s film, and the fact that LV-223 in the comic has a very different landscape now than it had in the film). If we work backwards from there, and factor in the ending of Prometheus, we can at least make some guesses about things that could happen in the second film. There are potential spoilers ahead – turn back now if you don’t want to know anything about the end of Prometheus. When Ridley Scott’s film ends, we find Shaw (Noomi Rapace) and David (Michael Fassbender) setting off in search of the Engineer homeworld to find answers to everything that’s going on. They’re also carrying an extra guest, but that’s not particularly relevant at the moment. What is relevant is that a hundred years later, Weyland-Yutani is sending another ship to LV-223. This would seem to indicate that Shaw and David either never make it back home to Earth after presumably finding the Engineers in Prometheus 2, or that they somehow do, but Weyland-Yutani buries their version of events and no one’s the wiser. You would have to think that if word about what happened on LV-223 got out, it would be a pretty big deal on Earth. That the comic features a large cast who seem to completely buy into the idea they’re just going on a salvage mission seemingly indicates they either flunked history class, or that they never knew exactly what happened to the Prometheus crew in the first place. What, exactly, happens to Shaw and David? That’s something we’ll probably have to wait for a second film to resolve. Other than that, it looks like we’ll have to take Dark Horse’s new tale on its own merits and not try to extrapolate how it ties into the greater narrative tapestry Ridley Scott and his team are weaving. All we can do at this point is speculate – and for all we know, Prometheus 2 could be about something entirely different than what’s set up at in the final moments of the first film. That’s half the fun of fandom, though – getting to hash out theories with other fans. Perhaps we’ll be able to piece together more of the bigger picture as subsequent issues of Prometheus: Fire and Stone are released, but in the meantime, share some of your own theories about where you think a second movie will take this fascinating mythology.